What food makes you most think of Christmas? Might it be mince pies, or maybe gingerbread men, could it be that jello salad that your grandmother always made? So many foods are associated with the Christmas holiday; candy canes, nuts, turkey, clementines, that dreaded fruit cake, but for me and mine it's definitely tourtiere, the traditional French Canadian meat pie. 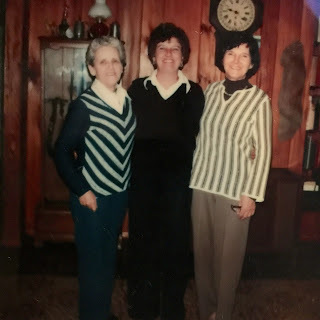 Above you'll see my inspirations, my memories, the lovely women who toiled at Christmas to bring us wonderful traditions and fill the house with fabulous smells. And so now, to me and mine, this tradition is passed down, these fragrant and tasty pies are made again, each and every year. 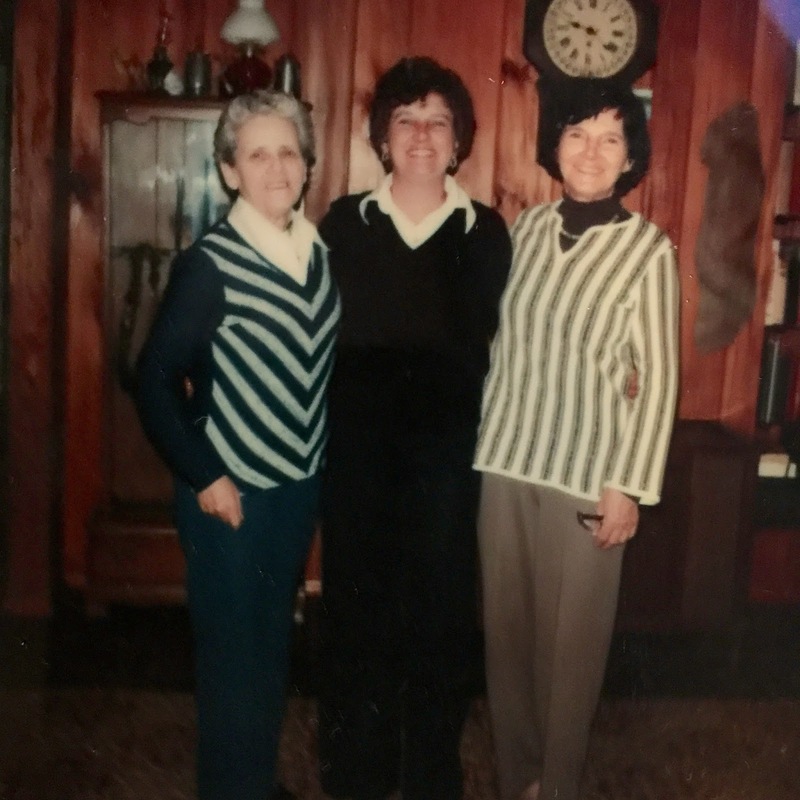 It's a labour of love, of preserving the past and hanging on to those we cherish and honoring their talents and love for family. I miss those lovely women, but when I work the crust and simmer the meat with all those spices, they come alive again. Christmas is here, the memories come alive, it's all about love and family, and passing down these wonderful culinary traditions. To start, use good meat. If you can, grind it yourself or go to a reputable butcher and get them to grind the meat fresh for you. Try to get free-range organic, it's always worth the price and peace of mind to get humanely raised meat. You'll need both beef and pork, more pork than beef. One pie needs about 2 1/2 pounds of meat, so 1 1/2 pounds of pork and 1 pound of beef is a nice mix. 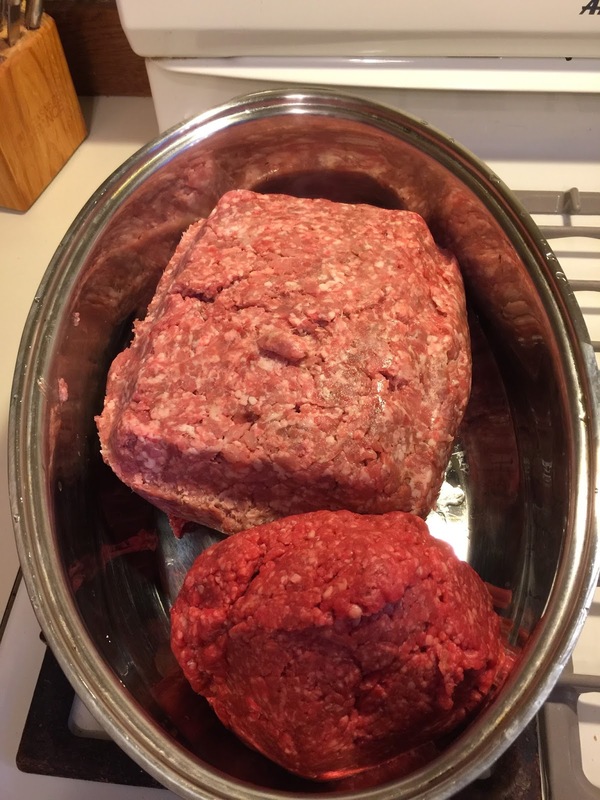 I like to grind my own beef chuck, and for the pork, a tenderloin is perfect. 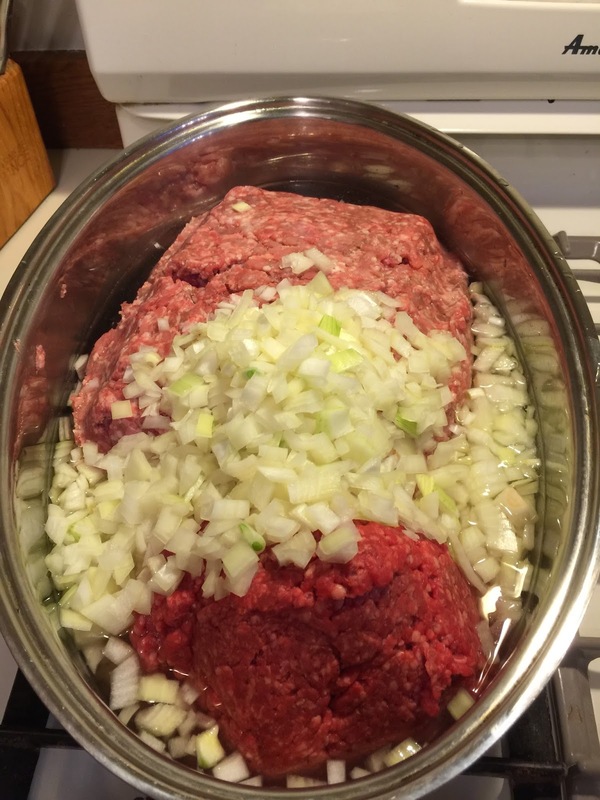 Put your meat in a very large pot, and add a ton of onion (about 2 large onions, chopped) and 4 cloves of garlic, minced. Next, after you've put your raw meat in a large pot, along with the onions and garlic, it's time to add the water and spices. 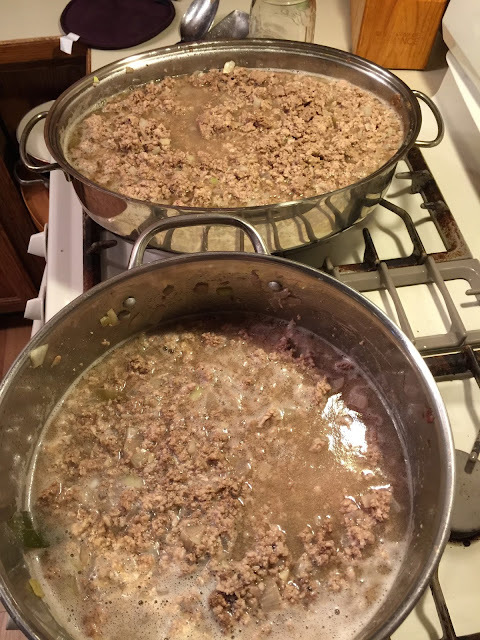 Add water to just cover the meat and onions, and now to flavor this fabulous mixture- you'll need 3 bay leaves (they make literally everything nice), 2 tsp of allspice, 1 tsp of ground cloves, 2 tsp of savory, 2 tsp of pepper and 2 tsp of salt. Break everything up with a large wooden spoon, turn the heat to a nice medium, watch it for 10 minutes or so, enjoy the smell as it all starts to come together. When you see a bit of action, some bubbling, turn it down to a nice simmer, grab a jelly jar and splash in a bit of brandy and sit back and enjoy the lovely smells that will soon permeate your kitchen. Close your eyes for a minute, remember all those Christmas's past, put on some great holiday music, and just revel in the moment. Add water to cover, mix in the spices and wait for nice smells to fill the kitchen. If you need some Christmas music inspiration, here's a great one by the Pogues- featuring Kirsty MacColl, Fairytale of New York. Here's another great tune, Rudy, by The Be Good Tanyas. By now you must be immersed in great music, great smells and a slight buzz from that little snifter of brandy. Okay, roll up your sleeves, because it's time to make some crust in which to put that savory meat. Ah, homemade crust, everyone gets a bit hesitant here, but let me tell you, your worst effort will be 100 times better than store bought crust, so buck up and get out the flour. For your crust recipe, look under Best Pie Crust under Coconut Cream Pie in June 2010 on this blog. You've got plenty of time, your meat should cook at a slow simmer for about 3 hours. 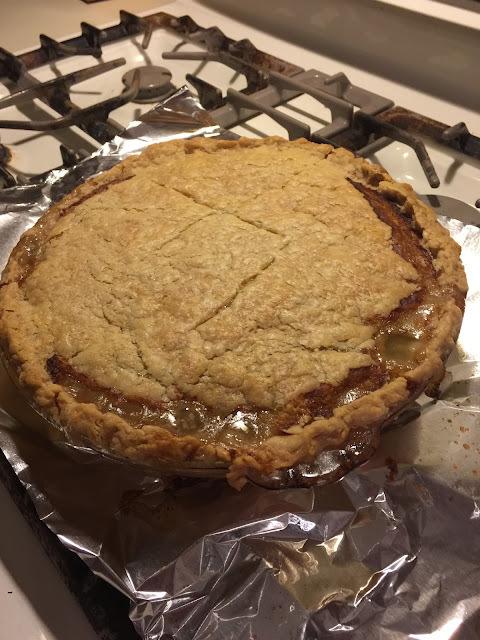 Once your crust is made, and the bottom crust is pressed into the pie plate, fill with the meat, but drain off some of the water first if it seems too soupy, you want it moist but not sloppy. Pop on the top crust, and put your pie in at 400 for 15 minutes, then turn down to 350 for about 45 minutes. Get ready for a slice of Christmas heaven. Tourtiere is a great dish to have on hand over the holidays, it heats well in the microwave, a slice at a time for whenever someone needs a bit of love and sustenance. Serve it with bread and butter pickles or chutney, and always with a kiss. The smell of Christmas, a French Canadian Toutiere meat pie. 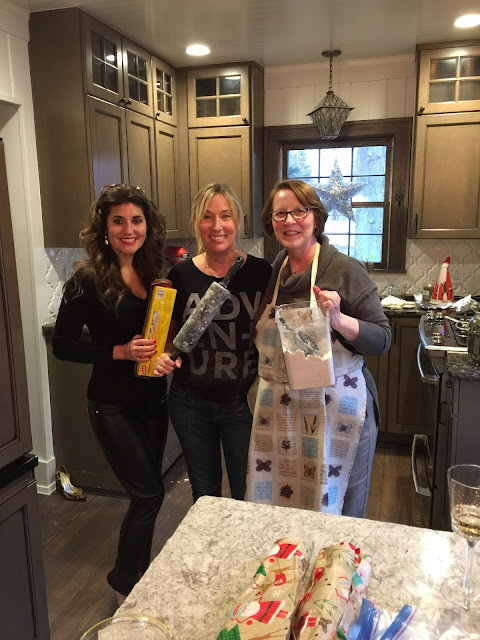 From left to right, my daughter Natashka, myself, and lovely friend Donna Nowak, making tourtiere!